Congratulations on your recognition…recently found your blog, some great reading here, will visit again. Congrats my friend! What a stellar freshman year you’ve had! Thanks Andrea! It has been amazing, no question. Let’s have lunch soon—we’re way overdue! Thanks so much for your visit, and your kind words. 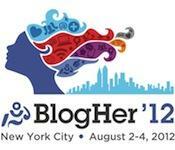 Sorry you won’t be at BlogHer, but I look forward to following your travels.